Victorian Opera’s audience showed great faith in the polish, variety and flair of the company by filling Hamer Hall for an evening where more than half the program consisted of new compositions sung by young singers. That faith was rewarded with a unique and fascinating evening, bringing the eclectic, entertaining 2015 season to a close. The capacity audience was, of course, due in no small part to the presence of Meow Meow on the bill, but more on the cult cabaret queen in a moment. In conjunction with the Composer Development Program at the Tasmanian Symphony Orchestra and Symphony Services International, Victorian Opera commissioned a series on new short pieces to be performed as a companion to Kurt Weill and Bertolt Brecht’s classic work Die Sieben Todsünden. Just as Brecht’s heroine Anna encounters the seven deadly sins in seven American cities, the new work paired each of the seven deadly sins with an Australian city. Four composers wrote the seven segments, which were united cohesively by a prologue and epilogue. Melbourne-based composer Julian Langdon wrote a jaunty male duet about a gluttonous Adelaide food critic trying to part ways with his constant companion Appetite. Langdon also provided the binding bookends to the piece, which successfully linked the pieces both musically and thematically. Mark Viggiani, also from Melbourne, created an amusing scenario in which a crown prince must choose between three female contestants, representing Hobart, Melbourne and Sydney. Despite Hobart’s envy of the mainland cities, she was the one chosen for her virtues in this contest. Viggiani also supplied a thinly veiled representation of wealthy Perth mining magnate’s anger towards her father and his mistress. Being based in Sydney has given Ian Whitney plenty of opportunity to observe the types of metrosexual couples portrayed in his reflection on lust. A mini soap opera played out as couples bickered, cooed and swapped partners over brunch. Whitney also represented the sloth of Brisbane, where two layabouts, oblivious to a heavenly angel quoting 17th century poet John Milton, cannot be bothered be rising to fetch another beer. Jessica Wells composed an exciting sequence that could well be the opening scene of an exciting dramatic opera. In a chorus scene stylistically reminiscent of “Attend The Tale of Sweeney Todd,” we met John Wren, a divisive Melbourne underworld figure driven by greed. 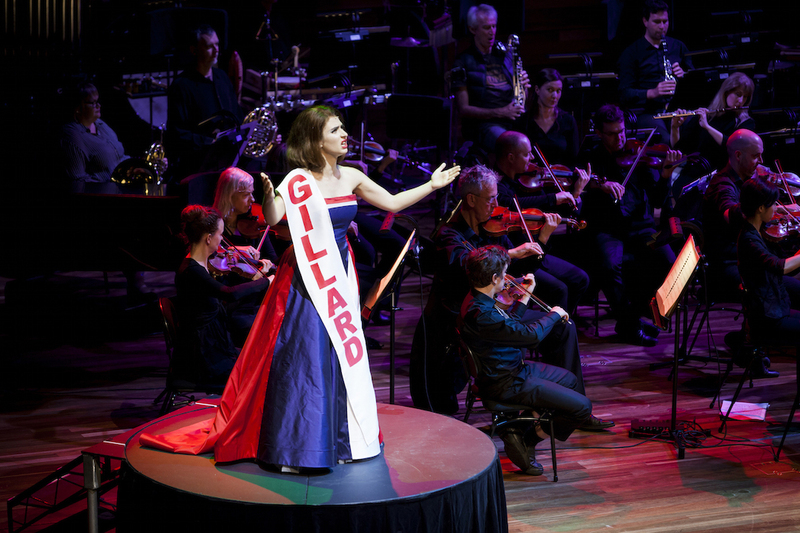 In what was probably the most popular section of the night, Wells revealed the singers’ surprising gifts for mimicry, with a crowd-pleasing look at the proud prime ministers of Canberra. 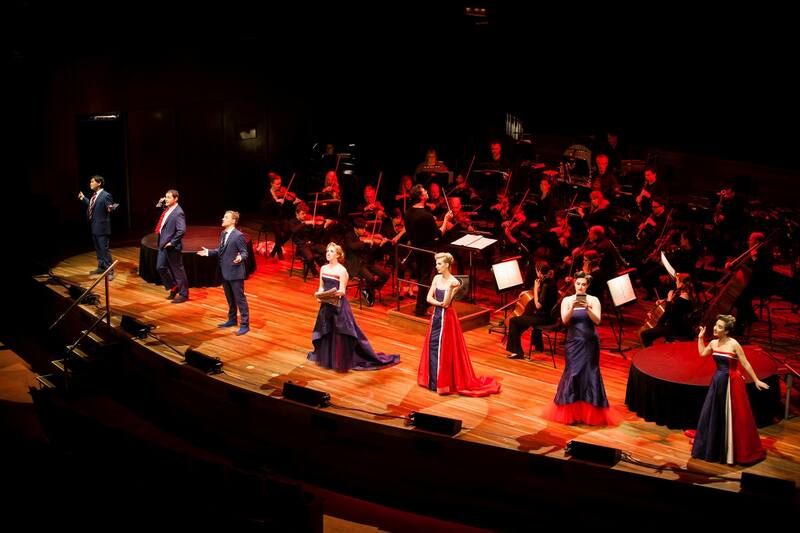 The seven cast members, graduating members of Victorian Opera’s Masters of Music (Opera Performance) program performed with great confidence, flair and polish. 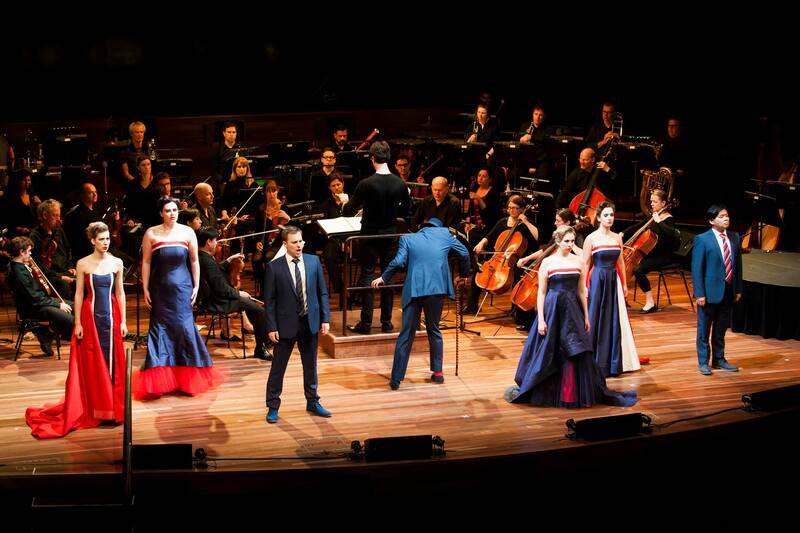 The singers looked quite divine in couture costumes from Linda Britten in glossy Australian blue, red and white. Cristina Russo was a delight as Milton’s Angel, also scoring significant points with her droll Julia Gillard impression. Michael Petruccelli neatly played the comedy straight as food critic Bob, and also created an intriguing twisted physical characterisation for John Wren. Emerging baritone Nathan Lay goes from strength to strength vocally of late, and provided several compelling performances throughout this evening. In a comic highlight, Lay clearly conveyed the inner workings and outer platitudes of a Speedo-clad Tony Abbott. Versatile performers Matthew Tng, Kate Amos, Elizabeth Lewis and Emma Muir-Smith each contributed enjoyable character work and wonderful vocals. While the Australian Seven Deadly Sins portion was perhaps a fraction too long at 75 minutes, each of the sequences were so well conceived that it was a pleasure to watch them unfold. Director Cameron Menzies maintained a deft lightness of touch, presenting the segments with individual quirks yet overall cohesion. Moments of choreography seemed to be out of the comfort zone of most of the singers, but with such an abundance of talent on display this was of no matter. Conductor Tahu Matheson presided over a sterling performance from Orchestra Victoria, allowing the new music sound familiar, comfortable and suitably interrelated. The quality of the compositions brought out the very best in the musicians and singers. After interval, Matheson maintained the musical excellence, with a slick, atmospheric rendition of Weill’s gently infectious score for Die Sieben Todsünden. Allow me to make a confession at this point: before last night I had not ever seen Meow Meow on stage*. Consider me a devoted fan henceforth. In a divine marriage of material and performer, the impossibly delectable Ms Meow Meow had the entire audience in the palm of her hand. From the moment of her first entrance, as the tiny figure of Anna struggled to climb up onto the stage, the audience seemed frozen, eyes wide, breath held, as if they dared not miss a second. 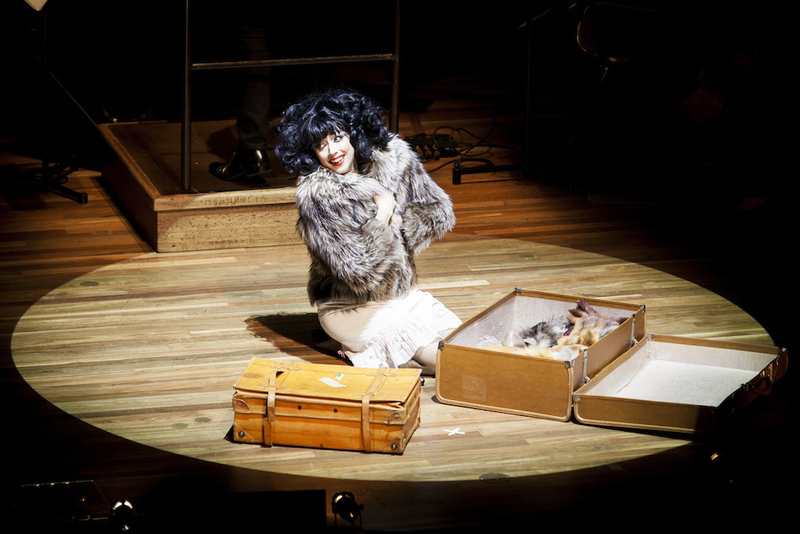 Somehow, the 2000-seat Hamer Hall auditorium was transformed to an intimate, smoky club of the Weimar Republic. A concise masterwork, Die Sieben Todsünden is by turns funny, melancholic, insightful and moving. 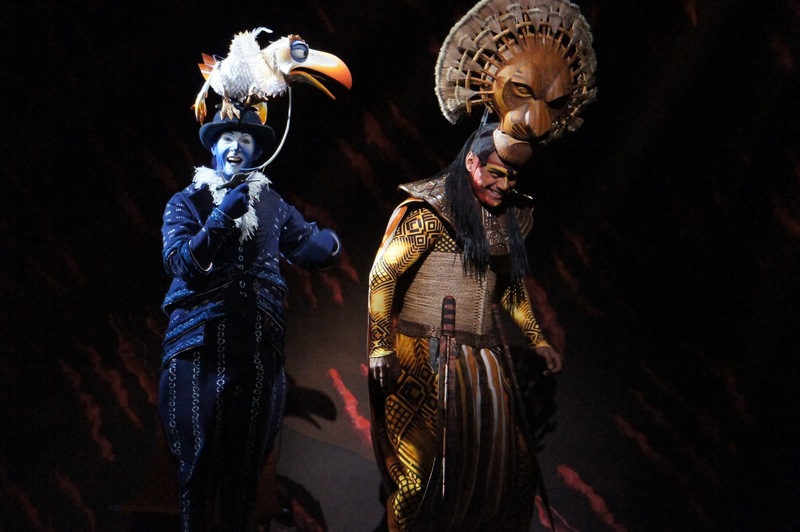 Meow Meow lands all of these emotions and more, singing the German text with breathy wonder. 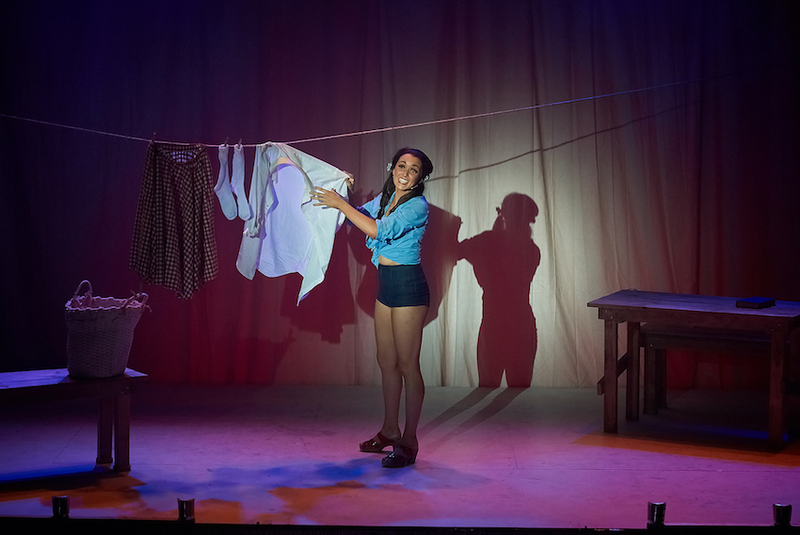 A balletic clown, the petite actress moves from physical comedy to pathos, vulnerability to resilience, sensuality to brawn, sorrow to glee, elegance to ungainly contortion, all in the flick of an eyelash. Menzies gives Meow Meow the entire downstage as a playground, setting Anna’s conservative family upstage, a living sepia-toned image in a picture frame. Lay and Petruccelli are joined by tenor Carlos E. Barcenas and bass baritone Jeremy Kleeman to create beautiful music as the family. Kleeman provides a nicely surreal touch as Mother with a beard. One of those you-just-had-to-be-there events, Die Sieben Todsünden was just divine. 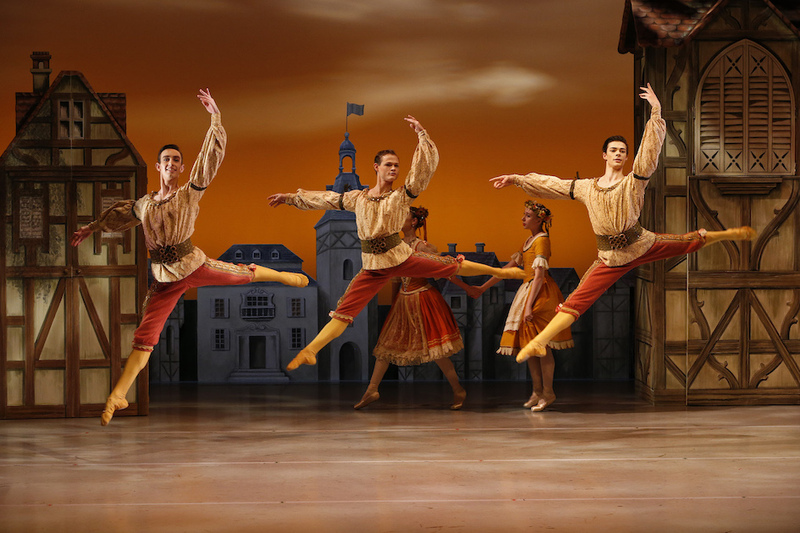 The program for Seven Deadly Sins can be read online. 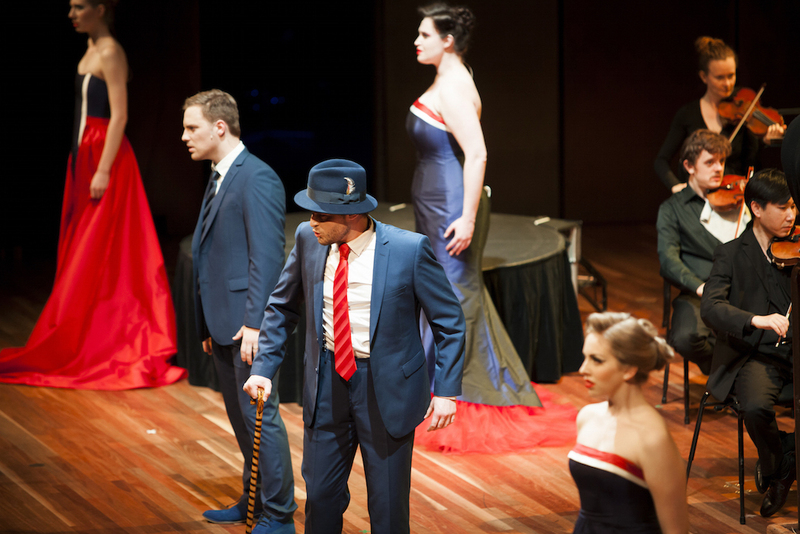 Seven Deadly Sins was performed at Hamer Hall, Arts Centre Melbourne, 7.30pm 6 November 2015. 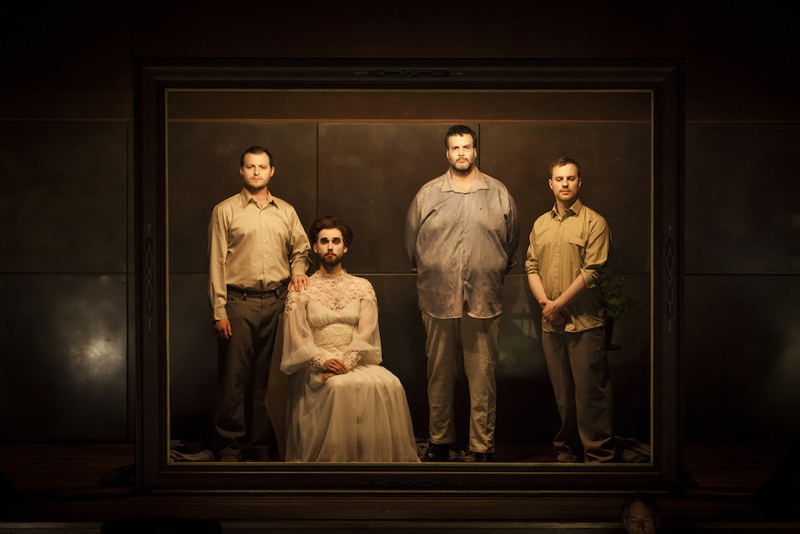 Victorian Opera has announced their 2016 season.